GPS Smart Watch PT88 comes with a multitude of features that makes it an ideal companion for the senior citizens. With its three-mode positioning systems, the GPS watch for elderly tracks your accurate location. 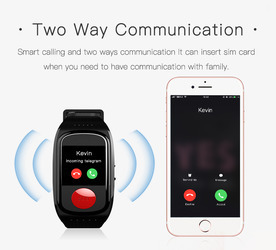 The smart watch for elderly is a must-have wearable gadget for all the working people who need to take care of their parents who are alone at home. At our elder watch factory, we provide elderly SOS watch ODM/OEM/JDM services to our clients so that they can have their own tracking system.